There’s a lot going on this summer! We’re very excited that SCamps was so popular last year, we’ve expanded and are offering TheaterSCamp and MusicSCamp in addition to ArtSCamp! PIE is also partnering with mainland organizations to provide even more opportunities for kids. All camps will take place at The Vinalhaven School. We’re looking forward to a fun summer! 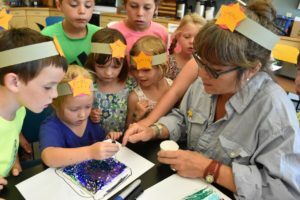 These camps are run by PIE in partnership with Vinalhaven School. Contact Hillary Savage to register or FMI: hsavage [at] islandinstitute [dot] org, 207-460-0873, visit PIE table at the Saturday Flea Market, or PIE on Facebook. Ages 4-7: 9 a.m. to 12 p.m.
Ages 8-12: 9 a.m. to 12 p.m. Partner programs are hosted and advertised by PIE, but are run by our partner organizations. Registration is through their websites. Ages 9-14: 8:45 a.m. to 3:30 p.m.
$50 rebate from PIE for Vinalhaven students! Ages 4-11: 8:30 a.m. to 3:30 p.m. It looks as though the only activities during the first week of July is Tanglewood. That appears to be off island, is that correct? Is the art camp more craft based or drawing etc? Thank you. The goal of ArtSCamp is to foster a fun environment for children to engage in the creative process, and offers a unique opportunity to approach “Art as Adventure”. All projects are designed to spark creativity, encourage curiosity and build confidence in our young artists, using a range of media. It is not specifically focused on skills development. Last year there were printmaking projects, collage, painted plaster of paris sculptures, observational drawing, crayon resist, decorated tiles, flip books, and watercolor painting. The students did an amazing amount of work and had a blast doing it! Thank you for your response and it sounds wonderful!